Our Heroes 3/4 pounder Bacon Cheeseburger with Tomato, Lettuce, Onion, Mayo, Dijon mustard and Thousand Island Dressing on a Cheddar Bun. 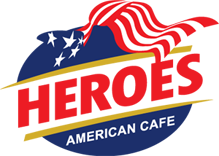 (only $10.95 $12.95 with chips and a 32oz large drink to wash it down) WIN Heroes Designer Cap if you finish in 10 minutes. (and without fainting or blowing up) Limited time. Tell your friends that like a delicious challenge! Best fresh meal I ever had. Every one cook before my eyes. Great French fries ever.? ?